Her chef’s knife split the week old green cabbage from the farmer’s market in two halves. She knew her family would not be excited to see that cabbage was for dinner. She didn’t care. She loved cabbage. She remembered sitting in her grandmother’s kitchen in a little town in north western South Carolina, close to the North Carolina boarder. Her grandmother would boil cabbage and serve it with morton’s table salt. Even as a little girl she appreciated the honesty and simplicity of green cabbage boiled not too long, so it was just tender, sweet, and a little salty. Now she preferred her cabbage roasted instead of boiled. She tossed the wedges in olive oil and sprinkled them with kosher salt and arranged them on a baking sheet in two rows, fat end of the wedge facing left. Into a 450 degree oven they went. She wasn’t sure if that was the right temperature or not, and considered cross referencing several recipes on the internet to make sure, and then decided not to, trusting the cabbage would cook just fine. And it did. 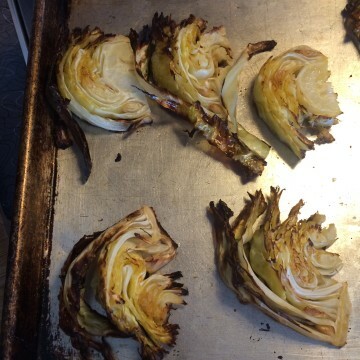 A half of an hour later she stood at the stove, nibbling on the crusty browned edges of the roasted cabbage. They would eventually get chopped up and added to a pan with last summer’s tomato sauce and chicken Italian sausage. But for now, they were hers to nibble on as she pleased.